Note: Originally posted on the "Lost World of Anime" website in 2006. Revised version published on the "Anime Archivist" blog in January 2013. In the year 2588, a worldwide war rages on. Towns are pitted against each other, and it seems there to be no end in sight to the fighting. There are three classes of humans in this world; “People”, who destined to live in poverty in the slums, “Troopers” who go into battle for money and credits in hope of reaching the third class of humans; “Citizens”. The so called “Citizens” live in the “City”, away from the war, poverty and disease of the Towns. To reach “Citizen” level, a Trooper must advance through levels “F” to “A” by killing Troopers from other Towns in battles planed out by the Town’s mother computer, “Little Mama”. Trooper Squad 16422 of Town 303 has arrived back after another battle. The squad is none too pleased to hear that a single man named Grey will be joining their squad as replacement for recently killed members. Grey is better known to all in the Town as “Grey Death”. Often Grey will be the only person in his squad to return alive from a battle. Squad 16422 are sent out on a new mission and take an instant disliking to Grey. They don’t like the fact that he refuses to obey orders or that he selfishly uses his own tactics to get the desired results to the determent of other Troopers. After taking on a platoon of armoured vehicles, the squad is reduced to half their number. Grey’s plan is to ambush the remaining enemy, but in the process only he and a female Trooper, Nova, survive. Though she finds him cold and distant at first, the two eventually become lovers. The relationship reminds Grey of his previous relationship with a woman named Lips. She became a Trooper to get out of the poverty of the slums, but eventually her number came up. Because of this, Grey decided to become a Trooper and attempts to avoid death at all costs to become a Citizen. In between battles, Grey is told that his old commander, Red, has been captured by the Resistance in Africa. Since Red helped Grey become the solider he is now as well as saving him on many occasions, he feels obliged to save him. With the unwilling help of Nova, the pair of them steal a fighter plane and head towards Africa. But upon arrival they are seemingly shot down by the Resistance. They come across Red’s destroyed carrier, but cannot find any trace of him. Searching for him, they eventually come a Shinto shrine, where a battle with highly advanced war machines they have never seen before is taking place. After the battle they meet a Resistance fighter named Lee. He tells them that Red willingly went to join the Resistance in their floating base Nagoshi. Along with two remaining Resistance fighters, Lee, Grey and Nova head off to Nagoshi, but a missile is fired at them killing Lee and the two fighters. Dazed and confused at the recent events, Nova and Grey begin to scavenge around the local battlefields in order to live. In the ruins of a battle scared town they meet a “Half”; a cyborg with no legs. His name is Robert, and in exchange for saving him and taking him to his battle tank, he gives them food and water. Robert also tells them about the Little Mamas, the war and more importantly where the City is and where Red can be found, Nagoshi. However if Grey and Nova decide to seek out the truth, their world may crumble before their eyes. This film is quite an interesting adaptation of Yoshihisa Tagami’s “Grey” manga. It was directed by Satoshi Dezaki, the late Osamu Dezaki’s older brother no less, though Satoshi’s style of direction is a world apart from his younger sibling. The movie was originally released in cinemas in a double bill with the “Guyver” movie. 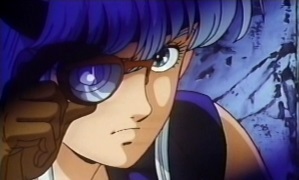 Like the manga, the film is set up in “chapters”, with a title card indicating a new scene transition. 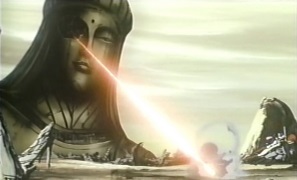 Up until Grey and Nova’s meeting of the Resistance, the movie follows the manga quite faithfully. One of the major changes was the reference to the non-Troopers and Citizens as “People”, something which isn’t mentioned in Viz’s manga adaptation. Also of note are Nova’s comments about the Troopers lifestyle and her shock at discovering that Grey still lived in the slums with the “People”. One of the male Troopers in Grey’s doomed squad makes a less than subtle pass at him (a somewhat homophobic scene in retrospect) and the Resistance also make an early cameo appearance. Neither of these short scenes are not in the manga version either. With the aftermath of the surviving Resistance member’s attempts to get to Nagoshi, a major section dealing with one of the characters has been drastically changed. I’m not sure why the director decided to do this, as it was pretty unnecessary. But looking at other anime films of the time, I’m really not surprised. Other than these mostly cosmetic changes, the story of “Grey” hasn’t really been altered that much. What I really like with this adaptation is that for the most part it keeps its nihilistic tone. It’s a very dark and somewhat depressing film, which is pretty unusual when you look at other anime films of the period. The animation has certainly aged somewhat in the thirty years on after its release, as have the character designs and mecha (all of which isn't all that surprising). However the soundtrack is not all that bad. It’s synth heavy and very 1980’s, but it’s quite dark and brooding and matches the images and story well. There are some problems with the film, and if you read the manga you can see why. Due to the story and the world the characters live in, as you can imagine character development is pretty much impossible in this film. Just about everyone dies within a few minutes of their screen time with the exception of Grey and Red a couple of others. We’re not told too much about Red, and Grey can be arguably seen as an unpleasant person who could potentially be hated by audiences. Luckily he redeems himself by the end of the film. 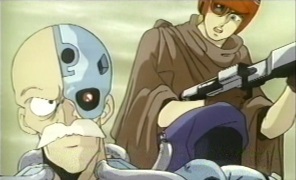 Satoshi Dezaki tries to make the deaths of Lee and the two Resistance members emotional for the audience by adding some extra dialogue with them and Nova, as well as showing a quick montage of them in happier times. But it comes off as rather cheesy and destroys the emotional impact their deaths had in the first place. Another pointless scene involved gratuitous breast shots of Nova before Grey and her make love. It just seemed rather pointless and unnecessary. Dezaki has also turned Nova into a bit of a “girly-girl” at times instead of the hardened solider she’s portrayed as in the manga. “Grey: Digital Target” is one of those rare anime that got a UK release from long gone video company Western Connection about three and a half years before the US. I was very fortunate not to get this version as like the majority of their titles, I imagine the subtitles were quite poorly timed (I’ll be doing a series on that company and their releases in the near future). I haven’t watched Viz’s dubbed version, but their subtitled release is excellent. Overall I think this film won’t appeal to many anime fans now days. It’s rather dark, somewhat weaker than the manga and visually very 1980’s. The main problem with it is that Dezaki seems to be at times trying to make the material a bit lighter and friendlier to a general audience, and it just comes off as cheesy at times. Despite the fact I think the manga is far superior, I quite like this film. It’s not a classic and has aged quite a bit especially in terms of the animation, but it’s a really solid piece of entertainment in a slightly trashy B-movie kind of way. I have to admit that I was rather disappointed with the film the first time I watched it, but with later viewings I really warmed to it. If you’re into dark dystopian sci-fi films and 1980’s anime, this is probably something you’ll love. For whatever reason the film barely gets a mention, if at all, when people discuss 1980’s anime. It seems to have slipped into the cracks and been bypassed by a lot of fans. Why this is a bit of a mystery as it’s actually not bad at all. In fact it’s much more mature, cleverly plotted and visually pleasing than a lot of sci-fi anime that came out of that decade. While Viz seem to still have the manga in print in the US, it seems to be not the case in Japan. A cursory search failed to bring up anything in print, manga or home video, in regards to “Grey”. In fact I couldn’t find anything related to Yoshihisa Tagami in print (mysteriously most of his manga was republished around 2006 and 2007, but has since been deleted). Of course there’s no BD or DVD version the film released in Japan. Some second hand copies of VHS or LDs of the film can be found online. French video company Kaze did release a DVD of the film in 2001, but this disc is long out of print as well. According to a reader who commented on my old blog, the French DVD is missing the film’s epilogue (if you decide to get this film, don’t switch it off until the closing credits have finished). It seems that everyone has forgotten this film and its author which is such a shame. 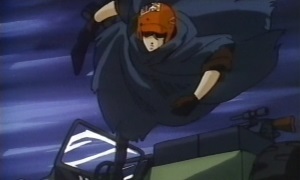 If you have an interest in 1980’s sci-fi anime, you really owe it to yourself to hunt down this film.